Jaybird X4 Wireless Sport Headphones are a perfectly passable set of workout headphones, but lack the sound quality and comfort for everyday listing. The Jaybird X4 Wireless Sport Headphones are the latest addition to the X-line of exercise earbuds. The fit and finish seemed perfectly designed for gym sessions and morning jogs, but the whole package didn’t seem designed for commuters and travelers. There are a lot of bells and whistles that aim to give you some interesting sound quality customization, but we’ll unpack that in a later section. We found, for the most part, that these were just smoke and mirrors, an attempt by the brand to play in the more premium space alongside other $100+ headphones. If your main focus for a set of Bluetooth earbuds is for active use, then they would certainly be a great option for you, but commuters and audiophiles should steer clear. We spent the better part of a week testing the X4 in New York City, evaluating their build quality, comfort, sound quality, and battery life. Take one look at the Jaybird X4 and it’s clear that they’re designed for runners and outdoor athletes. We tested a mostly black set of earbuds with clear silicon tips and a nice contrasting lime green/yellow color in the housing underneath the silicon tips (Jaybird calls this Black Metallic-Flash). It’s also available in a light gray with blue accent (Storm Metallic-Glacier) and a darker gray with sage green accent (Alpha Metallic-Jade). The flat rubber cable is rugged-feeling, and doesn’t tangle easily. The remote is a decent size (1.5 inches long and about 0.5 inches wide) and easily accessible with satisfyingly clicky buttons. While normally the ear tips on headphones are relegated to the “comfort” category — and don’t worry, we’ll definitely get to a discussion about comfort — we did find that most of the design charm with these earbuds was lost when you switched from the see-through silicon tips to the solid black foam tips, mainly because you lose the accent color. There’s a satisfying fullness and richness to them that will give fans of electronic music a certain satisfaction. The headphones were also pleasantly light (only 0.6 ounces on our scale), while also managing to feel substantial. That’s important because while you don’t want them to weigh you down, they also need to feel like they aren’t going to break mid-run. We had really mixed feelings about how comfortable these headphones are. On the one hand, both the foam and silicon tips, paired with the soft silicon wings, feel really nice from a textural standpoint. But, because of the size of the tips (either 0.5-inch or 0.3-inch in the foam, and 0.7-inch as the smallest size for the silicon), they created a borderline-uncomfortable seal in your ear. We’re guessing this is by design, because it helped to isolate outside noise, and created a clean pallet for the Jaybirds’ sound quality. We would normally recommend you swap out the tip size, but we couldn’t find the sweet spot when it came to eartip size. There is a workaround: you can pull these out of your ear slightly at an angle to release the seal a bit and rely on the wings to hold the headphones in your ear while relieving that uncomfortable seal pressure. All of that sort of defeats the purpose of a stable, firm workout headset though. If reliable fit is your number one priority, and you don’t mind the airtight seal, the fit on these will work great for intense physical activities. 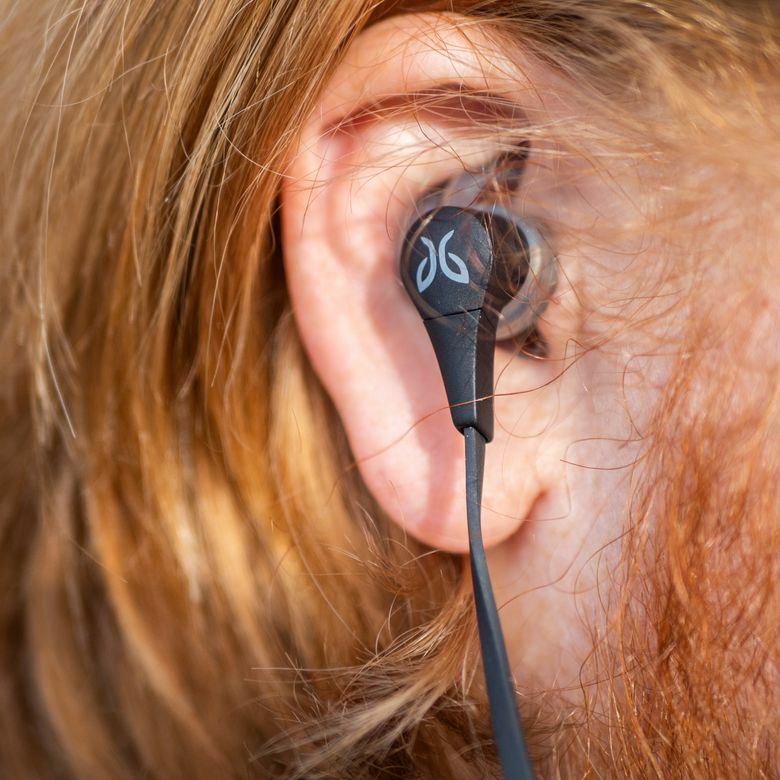 Durability is probably the most impressive aspect of the Jaybird X4. The 18-inch cable is a rugged, soft-touch rubber that doesn’t tend to tangle and feels like it will last for a long time. The earbuds themselves are small and substantial-feeling, and both the silicon and foam eartips felt great. The other pillar of build quality when you’re talking workout headphones is how resistant to the elements (and your sweat) they are. If you read Jaybird’s product info they sport an IPX7 rating, meaning that they’ll withstand as much sweat as you throw at it, and most rain and precipitation. That rating specifically means that the device can withstand faucet-levels of water pressure and temporary submersion in water, but can’t be submerged at great depths or for long periods of time, and don’t feature any dust resistance (that X would be a number if they were dust-resistant). This is all perfectly sufficient for heavy active and outdoor use, just don’t dunk them in a pool for too long. The Bluetooth connectivity of the Jaybird X4s is another category in which they check basically every box. The 4.1 protocol isn’t as stable as the latest Bluetooth 5.0, but is in line with most of the rest of the market. They connect via the 2.4 GHz band and support most profiles (A2DP, SPP, headset, etc.). They do all of this at the Class 2 level of range, allowing for up to 33 feet of distance between the transmitting device and the headset. We found that these were among the most stable Bluetooth headphones we tried, with very little skips and stutters, plenty of crystal-clear phone calls, and little-to-no interference. It’s refreshing when a set of headphones just works the way it’s supposed to. Honesty time: we wanted to love the sound of these headphones. And to be fair, these definitely don’t sound bad… there’s a satisfying fullness and richness to them that will give fans of electronic music a certain satisfaction. But, the heavy-handed use of bass seems to swallow up a lot of the detail. The headphones do check a lot of boxes on paper: 16-ohm impedance, a 99 dB (+/- 3) level of speaker sensitivity, 20Hz-20kHz of frequency coverage (the full spectrum of human hearing), and 6mm drivers (larger than a few of the other Bluetooth buds we’ve seen). But something happens when a headphone presses itself too firmly into your ear — it creates a kind of muffled, “inside your head” sound. Try this: plug your finger into your right ear and start speaking. You’ll hear an uncomfortable closeness and bassiness on your right side. That’s the issue we had with the subjective sound quality. Even if the output is perfect, our perception of that sound was too much. We found that these were among the most stable Bluetooth headphones we tried. Another couple of notes before we turn away from sound quality: the headphones themselves support the lowest level of Bluetooth compression, the SBC codec and the slightly higher AAC format preferred by Apple devices. That gives a nice versatility if you’re looking for streaming higher quality audio files, because AAC won’t cut as much out of the file. There is also an accompanying Jaybird app that we’ll go into more depth about later, but it is the most powerful tool we’ve seen on Bluetooth headphones for shaping the sound to your liking. There is a graphical Equalizer (EQ) interface alongside a variety of presets that will let you mold the sound based on what you prefer and, more excitingly, what specific application you’re currently using the headphones for. The Warmth preset was our personal favorite. In our real-world tests, the battery life on these headphones was basically just middle of the road. It was definitely not the worst we’ve seen, which is pretty impressive considering how much juice those large drivers, the higher speaker sensitivity and the app integration probably soaks up. Jaybird claims that you’ll get eight hours of play time on a single charge. This is, of course, dependent on your listening volumes, the amount of time you spend disconnecting and reconnecting, and even the genre of music. With our basic use, we got right around 8 hours of battery use, so the estimates from the manufacturer panned out. However, it’s important to note that it will take two hours to charge them up fully, which isn’t the fastest we’ve seen. You can get about an hour of play time on a quick 10-minute charge session, though. That’s handy if you need to go out for a quick run and the headphones are dead. One last note: the charger here is a proprietary Pogo pin connector, rather than the micro USB inputs of most other headphones on the market. This means you’ll have to bring the specific Jaybird charger with you wherever you go, so if you forget it, you’re out of luck. Both in our review and by looking at Jaybird’s website, it’s clear that the Jaybird app is a critical part of the full Jaybird X4 package. It allows you to sync up your buds easily, and at a glance. There’s a really interesting Find My Buds feature that will show them on a map on your phone if you ever lose them. There’s a host of how-to guides built right in the app, and even a Find Your Fit section where if you take a picture of the headphones in your ears, the app will give you recommendations of fit adjustments. We found this feature a little awkward because it’s hard to take a selfie of your ear without looking at it. Durability is probably the most impressive aspect of the Jaybird X4. But the most versatile feature here is the extensive EQ section. You can select a variety of presets that Jaybird has baked in including Bring the Bass, Warmth, and even a setting for extended listening that cuts volume down to help prevent ear fatigue. You can also create your own presets to further customize the sound. It’s a really powerful tool that is, unfortunately, undercut by the harsh fit and seal of these headphones. The Jaybird X4’s are on the steep side when it comes to price. On the one hand, they feel really premium, with a great unboxing experience. They also offer perfectly passable battery life, which will suit the needs of most athletes looking for reliable headphones. Included is a pinch-to-open pouch that serves as a pleasant storage and transport solution, though it won’t provide the protection of the hardshell cases on more travel-focused models. But this price point should imply impeccable sound quality. Unfortunately, despite Jaybird’s best efforts — a really powerful app, sizeable drivers, and good bass response — we just don’t feel the listening experience warrants $130. If the price is an issue for you, we’d recommend looking at the older Jaybird X3s, which have certainly come down in price to make room for the X4s, or even the Tarah Pros that seem to have better sound quality to price tradeoff. On price alone, the X4 seems to compete directly with the Bose Soundsport, the Sennheiser CX Sport, and the Shure SE215 headphones. Those are three powerhouse brands when it comes to sound quality, each offering decades of sound tech and research. Even though some of the other headphones in the category are more expensive, the Jaybirds’ price point is not exactly affordable. If you’re in the market on sound quality alone, you might be better served with the Bose or Shure offerings. However, based on built quality, though we haven’t spent much of any time with the Sennheisers or the Shures, we can confidently say that the Jaybirds feel premium and will likely last you a long time of vigorous use. Check out our list of the best wireless earbuds, as well as our picks for the best wireless headphones and the best exercise headphones available today. Bluetooth headphones that are great for the gym, but not for everyday use. If you want only a reliable set of running headphones that won’t break down on you, then look no further. If you need something for more all-around, day-to-day use, you’ll find better comfort and better sound, and often a better price, on other headphones. Product Dimensions 21.5 x 0.5 x 0.9 in.